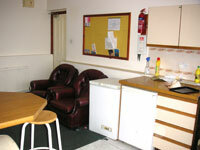 We are able to offer a choice of room size within a 2,4,5,6,or 7 bedroomed flat. Most flats have gas central heating but two have electric storage heaters. 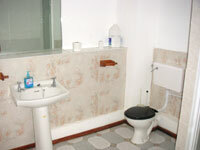 Each flat has a kitchen/diner/sitting room and a bathroom with shower, WC and washbasin. The flats with more than two bedrooms have two bathrooms and at least one cooker, refridgerator and sink per four residents. 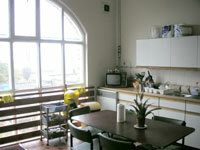 Each kitchen has at least one microwave oven. The study bedrooms are carpeted and furnished with a bed (single) bedside cabinet, chest of drawers, double wardrobe, bookcase/shelves, study desk, office-type chair and a noticeboard. 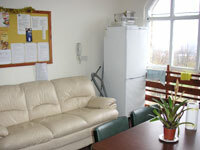 Each room has a telephone point, through which broadband internet access can be arranged, and a television aerial point.